August 22, 2012 - U. S. Transportation Secretary Ray LaHood today announced a $6.8 million dollar grant to rehabilitate the primary runway at Boise Air Terminal Gowen Field in Boise, Idaho. The Secretary made the announcement during a visit to Boise. He was accompanied by Mayor David Bieter and U.S. Representative Randy Labrador. Boise Airport also known as Boise Air Terminal or Gowen Field, is a joint civil-military, commercial and general aviation airport located three nautical miles south of downtown Boise in Ada County, Idaho, USA. 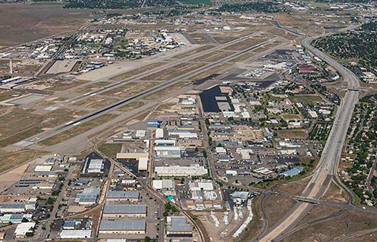 The airport is operated by the city of Boise Department of Aviation and is overseen by an Airport Commission. “Safety is our number-one priority,” U.S. Transportation Secretary Ray LaHood said. “This grant will help enhance safety for both the traveling public and the pilots who use the airport.” The Runway 10R/28L rehabilitation project will extend the useful life of the pavement and improve it to provide more traction for aircraft landing and taking off in wet weather conditions. The project also will enhance drainage of the runway surface and provide grading improvements to the runway safety area. “This primary runway is critical to operations,” said Acting FAA Administrator Michael Huerta. “This grant enhances the operational safety and efficiency of the airport, enabling it to provide continued quality service to its customers.” Runway 10L/28R will be used during project construction, which is scheduled to begin later this month. The airport expects to complete the project by November 2012. The Airport Improvement Program (AIP) provides $3.35 billion in annual funding for projects that are vital to maintaining the safety, capacity, and environmental stewardship of our airports. More than 3,300 airports are eligible for AIP grants benefiting commercial passengers, cargo operations, and general aviation activities throughout the nation.